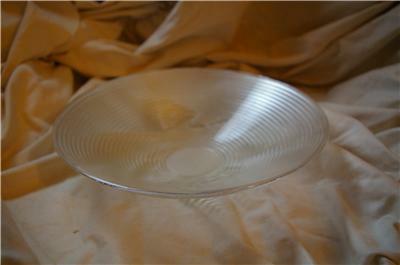 This versatile candleholder is a clear glass bowl. It has textured rings encircling the sides. It measures 11" in diameter. 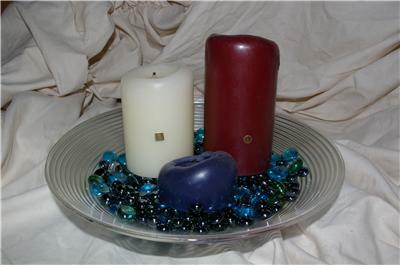 It can be used to display 3 wick candles or to create a pillar garden by adding decorative stones or sand. 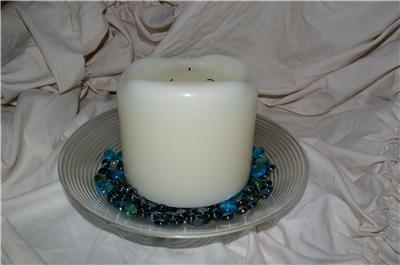 Or fill with water and use floating candles. This candleholder is in great condition. Candles and decorative stones are for display only and not included in this auciton. If the description or the photo does not answer all your questions, please email me and I will get back to you as soon as possible. I accept Paypal only. Immediate payment required. Please be aware that echecks usually take 5-7 days to clear. If you use that option for payment, shipping will be delayed until Paypal allows access to the shipping link once funds have cleared. Items ship in 1 business day of Paypal payment clearing, but always within 7 days of payment clearing. Items will be shipped to the address in Paypal the payment only. If more than one shipping method is offered, please select the method that is the best rate/delivery time to meet your needs. I have no control over shipping time once the item is in the hands of the Post Office. I do not ship to APO, Puerto Rico or Canada addresses at this time. I do not ship to any address requiring a Customs Form at this time. Please be sure to read the entire description and review all photos carefully before you buy, as they are an important part of the item description to be sure the item is what you are looking for. If there are any questions about the item, please e-mail me and I will answer as soon as possible. Use the "Ask a Question" link shown in the listing if you have any questions about this auction or any of my other auctions.